Open Road is constructed on text from “Song of the Open Road” by Walt Witman. 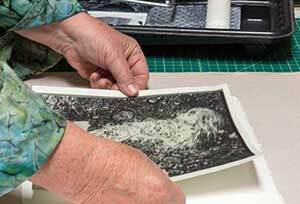 In the original book the images are linoleum prints. I showed this book earlier in this blog. In response to requests to know how to do drum leaf binding I took some picts while making a copy of “Open Road” using digital copies of the original prints. I displayed my process on www.jandove.com. Here is a re-publication. 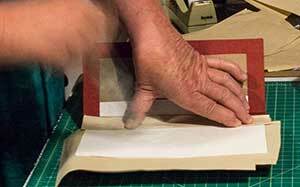 Drum Leaf Binding, a relatively simple technique, is good for books of images where you don’t want binding thread distracting from the images. 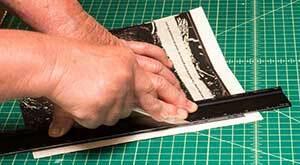 Also good for books with pop-up pages. 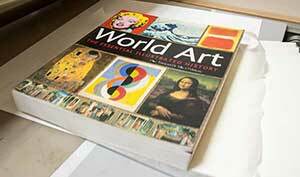 Each page was printed on lightwweight Asuka paper, and needed heavy backing. I applied PVA glue to BFK Rives. This mimicked the original which is chine collé. 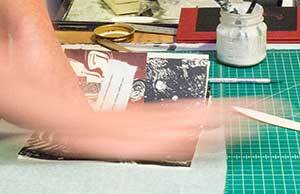 and pressed with a “heavy” book. 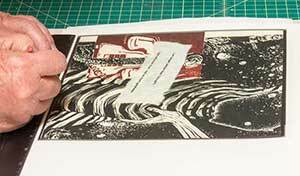 I used waxed paper first, then replaced that with newsprint to facilitate drying. Because each page is two layers, I took steps to insure there was no unsightly crumpling in the crease.First step: score. 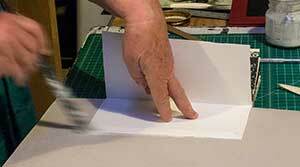 I started the fold this way to minimize the dreaded crumpling. 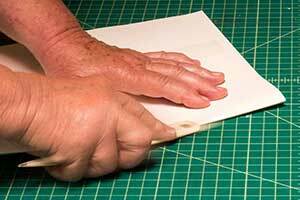 Finish the crease. 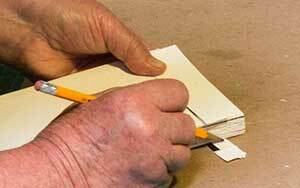 I did this to all the pages. 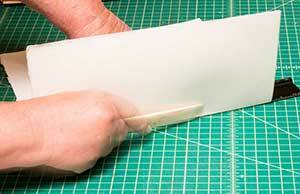 Trim excess paper on all pages. 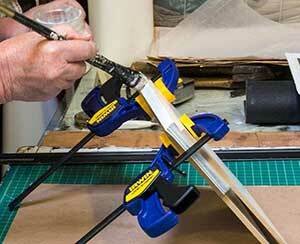 I clamped the block carefully between two boards, leaving the spine free, and I applied PVA glue. I worked the glue in and gave it time to dry completely. If you have a guillotine, use it. 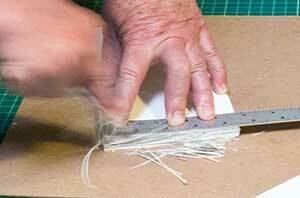 If not, put a fresh blade in your exacto knife and trim very carefully. 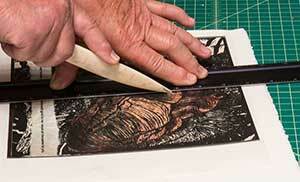 It is important to keep the blade absolutely perpendicular to your cutting surface. 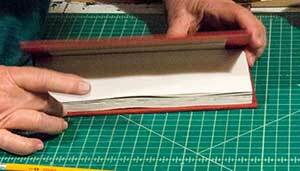 Starting from the back of the book, I glued the backs of the pages together. I used a scrap to measure how wide the cover should be. 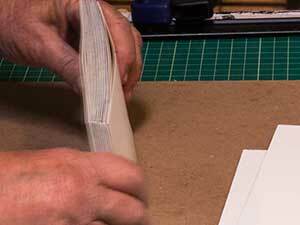 I glued the back of the back page, leaving .5″ unglued next to the spine.That blur you see is my brush with glue. I blame the photographer that it is not more clear. 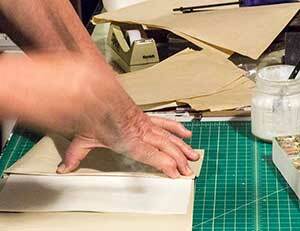 I placed the block – wet glue down – inside the cover, and pressed. 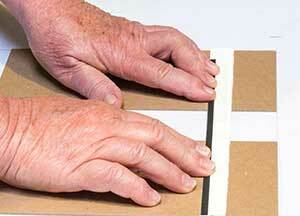 I glued the back of the front page, leaving .5″ unglued next to the spine. 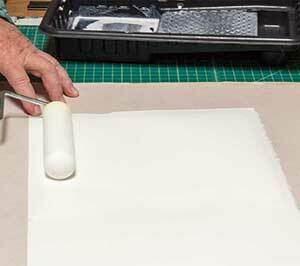 Important to note: there is no glue added to the spine in this step, and .5″ of back and front pages are left unglued next to the spine.If you are making your own book, the measurements — of course — will be your own.More blurred brush. Glad you like it. Hope it was helpful.